Ever-evolving Slovenian electronic music producer Gramatik (Denis Jasarevic) refuses to be put in a box. When I first saw that Gramatik was playing at the Tabernacle on March 2, I couldn’t remember why I knew his name. It was familiar; I knew it before the age of Spotify and Soundcloud. I searched for Gramatik on YouTube and came across “Hit That Jive,” which boasts a cool 18 million views. I instantly remembered Gramatik’s anachronistic blend of classic Hollywood and 1940s corny yet endearing samples, reworked into easy listening electro swing tunes. The chill vibe reminded me of Wax Tailor’s cheeky remix of “Que Sera, Sera” as performed by Doris Day in the 1950s. I was highly anticipating his Atlanta concert, but was dubious of how he would enthrall a crowd at a 2,500 capacity theater; his music seemed to evoke the feeling of sinking into a plush leather couch with a few of your friends. He started the concert with a bang, a stark departure from my expectations. I could hear strains of his laidback hip-hop vibe within the electronic beats, but they were layered beneath a new-age techno sound. Gramatik took the Adele approach to performance and stayed behind the DJ booth, allowing his talent to speak for itself. His experience behind the turntable was evident as he seamlessly transitioned between tracks. Energetic performer Martin Vogt, who goes by Haywyre, opened the show. The 25-year-old musician brought his classically trained jazz piano skills and linked them to a DJ mixing table for a brain-tingling effect. It is obvious why Gramatik identified Haywyre as a perfect addition to his North American Re: Coil tour. Both performers brought a surrealist sound that was reflected in the outlandish costumes that some of the crowd, an eclectic blend of young professionals and diehard ravers, was wearing (apparently I didn’t get the memo). My fears of a lukewarm zombie crowd listening to electronic study music were fully dismantled. The prevalent use of live instruments added a constant focal point that acted and reacted to the crowd’s cheers. The clever use of real-time video capture allowed the four large LED panels to show the audience Haywyre’s fingers fluttering across the keyboard. Between the variety of live music production and mesmerizing visual, the audience surely got their money’s worth. 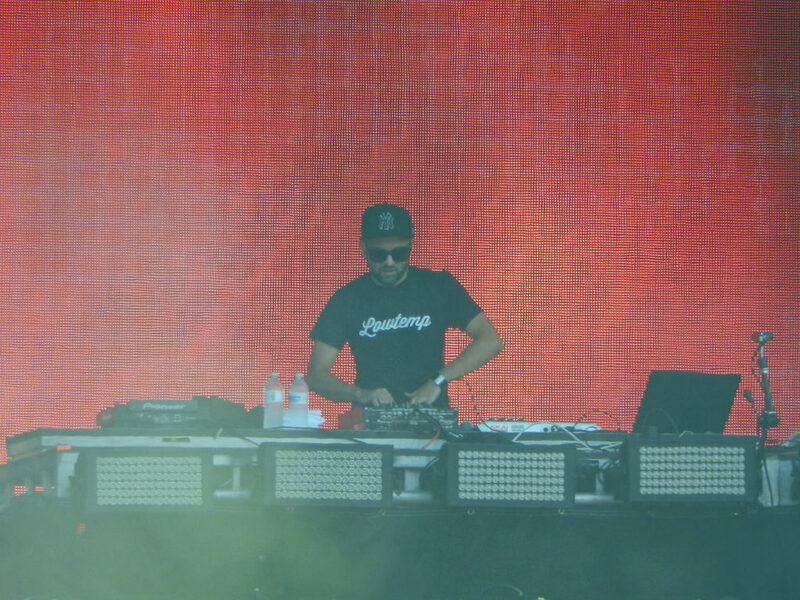 Gramatik collaborated with ethnomusicologist Will Magid, also known as Balkan Bump, who plays the trumpet and utilized his wide-spanning ethnographic cultural audio samples to transport the crowd from the seedy Berlin nightclub of Gramatik’s electroswing to an ‘80s outdoor beach party. An electric guitar player accompanied Balkan Bump from behind the turntable. But Gramatik has evidently made a number of sonic shifts as an artist. He began his music career 20 years ago as a 13-year-old hip-hop music producer in Portoroz, Slovenia, where Beatport, an online music store, scouted him. He has since been represented by numerous music agencies including the Pretty Lights Music label and recently started his own record label, Lowtemp Recordings, in 2013. The length of his career and wide range of influences resulted in a dynamic performance that raised my expectations for any other DJ or electronic music producer. Gramatik’s forward-thinking sound is accompanied by a savvy sense of self-branding. In 2017, he launched a cryptocurrency called GRMTK as a move to bring other big artists into his creative fold. His enthusiasm for cryptocurrency was apparent in his Tabernacle set design, where Bitcoin icons floated across the LED screens. He has also said that music should be freely accessible and cash flow should come from other venues. Using the cryptocurrency business model, he hopes that his fans can invest in him, and grow their own capital at the same time. It is impossible to guess Gramatik’s next career move or sound, but you can bet that he’s already thinking two steps ahead of the herd.